Please read these Conditions carefully before using the olivewoodturning.co.uk web site, part of Wood and Stuff Ltd.
1. Your rights: These Conditions offer you additional protection and do not affect your statutory rights as a consumer. 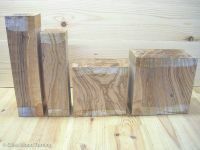 Olivewoodturning.co.uk, Wood and Stuff Ltd is a company, and so you are protected by UK consumer protection legislation. 2. Availability: Unfortunately we cannot always guarantee availability of our products. In the unlikely event of a product you have ordered being out of stock we will contact you as soon as possible and either offer you a full refund, an alternative product or place your order (in full or in part) on hold until we can fulfil it. Should your order be placed on hold, we will inform you once it is ready for dispatch. 3. Confirmation of orders: When you place an order to purchase a product from us, we will send you an e mail confirming receipt of your order and containing the details of your order. Your order represents an offer to us to purchase a product which is accepted by us when we send e mail confirmation to you that we've dispatched that product to you. Any products on the same order which we have not confirmed in a dispatch confirmation e mail to have been dispatched do not form part of that contract. 4. Payment and Dispatch: We accept all major debit and credit cards online or by PayPal . Orders will be dispatched once payment has been confirmed. 5. Breakages, losses and incorrect deliveries: In the event of your goods arriving damaged or being lost, or in the event of an incorrect delivery, you must notify us as soon as possible and (1) if your goods arrive damaged or are incorrect, within seven working days of their receipt or (2) , if lost, within 14 working days from the date of your order. After having discussed return details with us please return the damaged goods to us and we will arrange for a replacement to be dispatched. Unless otherwise instructed by us please return the items using Royal Mail Standard Parcel service. 6. Returns, refunds and order cancellation: If you are unhappy with your order, you must notify us and return the goods unopened and undamaged within seven working days of receipt for a full refund for the goods. Returned parcels charges and original delivery charges are non refundable. If your original order was eligible for free delivery but in returning the goods your order value falls into a delivery charge bracket, then original delivery charges will be applied or deducted from your refund. You must notify us of a parcel to be returned before returning it (by e mail, writing or telephone). All refunds will be made within 30 days of receipt of the returned goods. Unless otherwise instructed by us please return the goods using Royal Mail Standard Parcel service. 7. Mistakes in bills, receipts or payments: Mistakes in bills, receipts or payments will be corrected as soon as possible and within 30 working days. 8. Notifications: All notifications should be made either in writing, by telephone or by e mail during business hours of 9.30am 5pm Monday Friday. When ordering goods from us for delivery overseas you may be subject to import duties and taxes, which are levied once the package reaches the specified destination. Any additional charges for customs clearance must be borne by you; we have no control over these charges and cannot predict what they may be. Customs policies vary widely from country to country, so you should contact your local customs office for further information. Additionally, please note that when ordering from us, you are considered the importer of record and must comply with all laws and regulations of the country in which you are receiving the goods. Please be aware that cross border deliveries are subject to opening and inspection by customs authorities. 9. Liability: We will be responsible for any losses you suffer as a result of us breaching these Conditions if the losses were reasonably foreseeable to both you and us when you commenced using the web site, or a contract for the sale of goods by us to you was formed. We will not be responsible for any business loss (including loss of profits, revenue, contracts, anticipated savings, data, goodwill or wasted expenditure) or any other indirect or consequential loss that is not reasonably forseeable to both you and us when you commenced using the web site or when a contract for the sale of goods by us to you was formed. We do not limit in any way liability by law for death or personal injury caused from our negligence or breach of duty or caused by our gross negligence or wilful misconduct. 10. Events beyond our reasonable control: We will not be held responsible for any delay or failure to comply with our obligations under these Conditions if the delay or failure arises from any cause which is beyond our reasonable control. This Condition does not affect your statutory rights. 11. Termination and Cancellation: We reserve the right to terminate accounts, refuse order requests, remove or edit content, or cancel orders at our discretion. If we cancel an order, it will be without charge to you. 12. Alteration of our service or amendments to these Conditions: We reserve the right to change, modify or remove information from this web site from time to time and to change or modify these Conditions at any time. Prices, product range and availability of goods are subject to change. You will be subject to the Conditions in force at the time that you use the web site or that you order goods from us, unless any change to these Conditions is required to be made by law or government authority (in which case it will apply to orders previously placed by you). If any of these Conditions are deemed invalid, void, or for any reason unenforceable, that Condition will be deemed severable and will not affect the validity and enforceability of any remaining Condition. 13. Governing law and jurisdiction: These Conditions are governed by and construed in accordance with the laws of the United Kingdom. You agree, as we do, to submit to the non exclusive jurisdiction of the courts of the United Kingdom. By using this site you accept that it is at your own risk. We have taken every effort to ensure that the information on this web site is correct, accurate and up to date. However, any responsibility for information that is incomplete, inaccurate, out of date or reasonably defined as personal opinion is limited to that which is set out in our Conditions. Links from this web site are not under our control. We therefore will not be held responsible for their content, views or business practices. © Copyright Wooden Stuff Ltd.